We had a lot of fun a few weeks ago with the duet album featuring Gregg Allman and his wife at the time, Cher. So much fun, in fact, that I’ve dug up a few more duet LPs from my sister’s record collection, and we’ll be spinning those in the next few weeks. Today we have a duet album from two artists who also happened to be husband and wife: George Jones and Tammy Wynette. So we have Golden Ring, from 1976, which is one of about 10 albums recorded by the two country icons but it’s usually considered to be their best. Jones, the honey-voiced singer with a long line of country hits, and Wynette, herself no slouch in the hits department, married in 1969. Jones was no stranger to duets – he had previously cut duet albums with Melba Montgomery and the male singer Gene Pitney (“Town Without Pity”). When Jones-Wynette went into the recording studio together, they were really extending a time-honored tradition in pop music. The early 1960s saw duets from the likes of Paul and Paula, Dale and Grace and Marvin Gaye-Mary Wells. George n’ Tammy weren’t even the first husband-wife duet team: Steve & Eydie worked in the 1950s, and in the ’60s of course you had Johnny & June, Ike & Tina and Sonny & Cher. But here’s the twist: when they cut Golden Ring, George and Tammy were divorced! 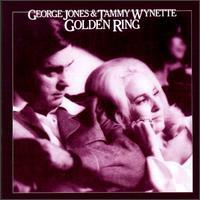 Golden Ring was the seventh duet album cut by Jones-Wynette, and it took as its title tune a story conceived by Nashville songwriter Bobby Braddock. He saw a TV show about a handgun that changed hands, and the drama showed the consequences of each person’s experiences with the gun. Braddock transferred the idea to a wedding ring and a series of incidents through the life of a young couple. Being a country song, you know how it goes: the couple are all lovey-dovey in the first verse, they get married in the second verse and the third verse takes us down the road as they break up when she tosses the ring on the floor and walks out. Naturally “Golden Ring” was a No. 1 country single. So was “Near You,” the followup single that charted in 1977. Maybe the fact that their divorce was still fresh and they had a young daughter gave extra emotion to the vocal performances. You can hear for yourself, these two singers were at the top of their game, and they had some great material to work with. Perhaps the best song here is “I’ve Seen Better Days,” which tells the story of a D-I-V-O-R-C-E and features a nakedly emotional performance by Wynette. The album is full of cleverly chosen covers: “Cryin’ Time” was a Ray Charles song, “I’ll Be There” was a hit for Ray Price, as was “If You Don’t Somebody Else Will.” “Tattletale Eyes” is a perfect jukebox song, and “Keep The Change” ends the album with two lovers talking and goin’ over the good times. Billy Sherrill produced this album, as he did all of Wynette’s recordings, and it has a satisfying blend of classic country touches (the weepy steel guitar) and orchestral flourishes that would later become the countrypolitan sound. Jones’ older records were rougher and rawer (perhaps more influenced by the rowdier Bakersfield sound), and when he left Musicor and went to Epic to work with Sherrill his sound became smoother and pop-oriented. Wynette went on to marry a couple more times after her divorce from Jones; her final marriage, to producer George Richey in 1978, lasted until her death in 1998. Jones would go into his notorious drug-and-alcohol period, earning the nickname “No Show Jones” for missing his booked shows. He married Nancy Sepulvado in 1983 and she not only became his manager, she also helped him dry out. Now a 79-year-old godfather of country music, George Jones continues to perform and show the young guys how it’s really done. This entry was posted on January 23, 2011 at 9:57 am and is filed under Lost Classics! with tags Billy Sherrill, George Jones, Tammy Wynette. You can follow any responses to this entry through the RSS 2.0 feed. You can leave a response, or trackback from your own site.